In 1999, Shanghai turned Nanjing Road, the city's most famous shopping area, into a walking street. On summer nights, thousands fill the street, surrounded by colonial architecture and riotous neon signs. In the 1920s and 1930s, Shanghai was one of the world's most exciting — and notorious — cities. But all that came to an end in the middle of the last century, when the Communists took charge. Over the past decade or so, though, a vibrant Shanghai has re-emerged. Today, it's a dynamic city of 23 million, with a skyline that dwarfs Manhattan's. 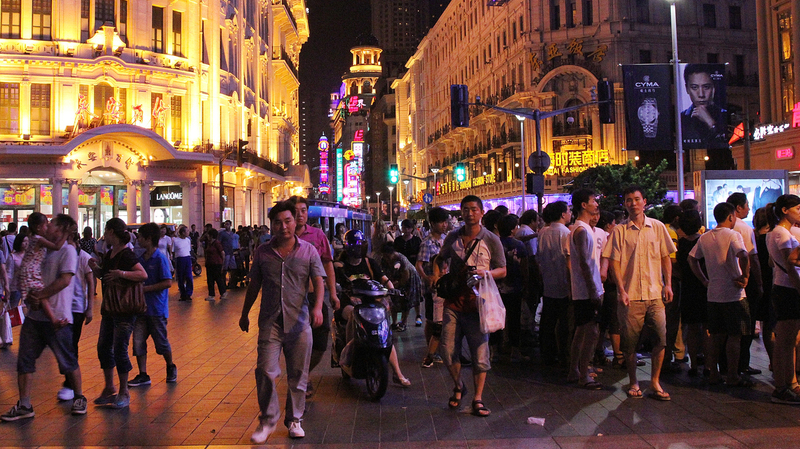 And on summer nights, the most vibrant place in town is Nanjing Road: China's Times Square. Thousands of people descend on the famed shopping street and stroll beneath pulsating neon signs, all set against colonial architecture that dates back to Shanghai's heyday. Hawkers weave between the crowds, selling everything from laser pointers to strap-on roller skates with wheels that light up when they spin. Perhaps what distinguishes Nanjing Road from many other walking streets is that it's a magnet for street performers. They aren't professionals who pass a hat after finishing up a number, but local amateurs who perform for the fun and the attention. One Sunday night, steps away from a Haagen-Dazs store, a band is working through a set of Chinese songs before a crowd of several hundred. The musicians are playing drums, flute and the erhu, a two-string Chinese fiddle. The "Loving Happiness Band," supported, in part, by the Communist Party, plays for a crowd on Nanjing Road. "We are all musical illiterates, but we really like music," says Wang Hongping, who first met her fellow band members in a local park and now sings with them every weekend. "We common people get together and sing Red songs — Communist Party songs — just to enjoy ourselves." Upon request, Wang breaks into an a cappella version of one of her favorites: "On Top of Beijing's Golden Mountain." One verse refers to Chairman Mao as a "golden sun, warm and kind." In fact, Mao Zedong hated this sort of Shanghai scene: riotous neon advertisements, scores of stores; a boisterous monument to capitalism. So, after taking control of the country, he put Shanghai into a deep sleep. Wang herself grew up poor on a fishing boat. She moved here from the countryside in the mid-1990s, as Shanghai was reawakening. Now 45, she works as a barber and sells clothes. Wang says Shanghai has provided great opportunities — including mentoring from her fellow music-makers — that she never could have found back home. "The Communist Party reformed and allowed us peasants to move to the big cities and realize our dreams," says Wang, wearing a blue and white polka-dot dress. "In the countryside, you could never find so many teachers who could teach you to sing." Up the street, next to an "I Love Shanghai" sign, a dozen people appear to be country line dancing between a pair of planters. But the music is techno and blaring out of a speaker that runs off a battery. "It's the 16-step dance, it's Chinese," says dancer Zhu Fengying, a retired crane operator who helped build Shanghai's second-tallest skyscraper, the Jinmao Tower. Public dancing has a long tradition in urban China. In the morning, it's common for dozens of people to ballroom dance in public parks. While the atmosphere on Nanjing Road is mostly joyous, there is a darker side. If you are a foreign male and walking alone, you can count on getting accosted by hookers. Constantly. Most dress normally, pretending to be friendly locals offering a look around town. Rebuffed, they tend to turn desperate and blurt out as quietly as they can, "massage." 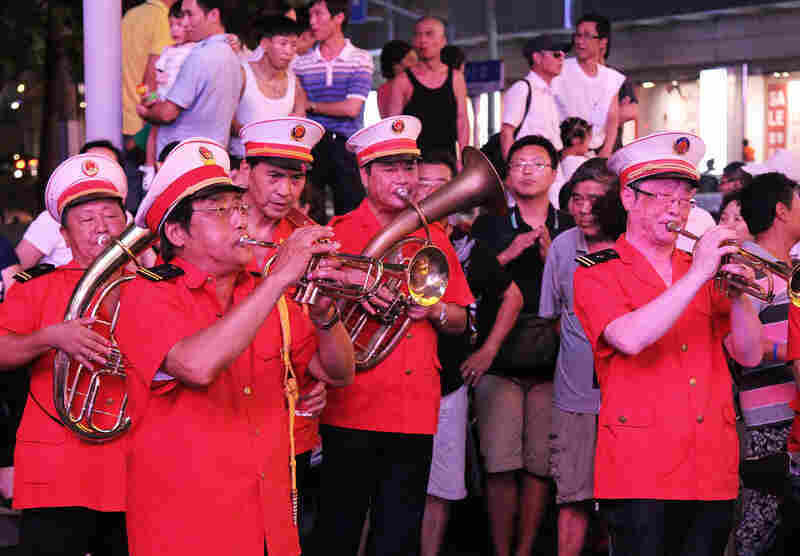 Most musical performers here are genuinely grass-roots, but the "Loving Happiness Band," a brass band of elderly men who wear matching bright red uniforms with epaulets, is a bit more polished. The band is private but receives some government support, hence the five-star government emblem on the musicians' caps. Like other performers on Nanjing Road, they play for crowds of Chinese tourists, but never ask for money. "The best thing about playing is it makes us happy," says Wang Geyuan, 73, who plays the saxophone. "If we're happy, the audience is happy." Wang, a retired artist with China's People's Liberation Army, opens his case and displays his saxophone. An inscription says the instrument dates to 1936. "This saxophone was made by an American company," he says. "It's not a very professional one. This is just a hobby." As 10 p.m. approaches, security guards appear, signaling it's quitting time. As the summer crowds thin, the brass band knocks out one final song. It's one both Chinese and foreign tourists are likely to recognize: "Edelweiss," from The Sound of Music.